When you try and install multiple antivirus (AV) solutions on a system running the Microsoft Windows operating system, the installation of other solutions may be blocked by the installed due to the fact that a security software is already running on the system. The core reason for this seem to be incompatibilities, but performance and system stability need to be mentioned in this regard as well. You may already know that Microsoft will ship Windows Defender with the Windows 8 operating system, which is comparable to the Microsoft Security Essentials program that is not compatible with Windows 8. At least the front of Windows Defender running on Windows 8 looks very similar to Microsoft Security Essentials on Windows 7. 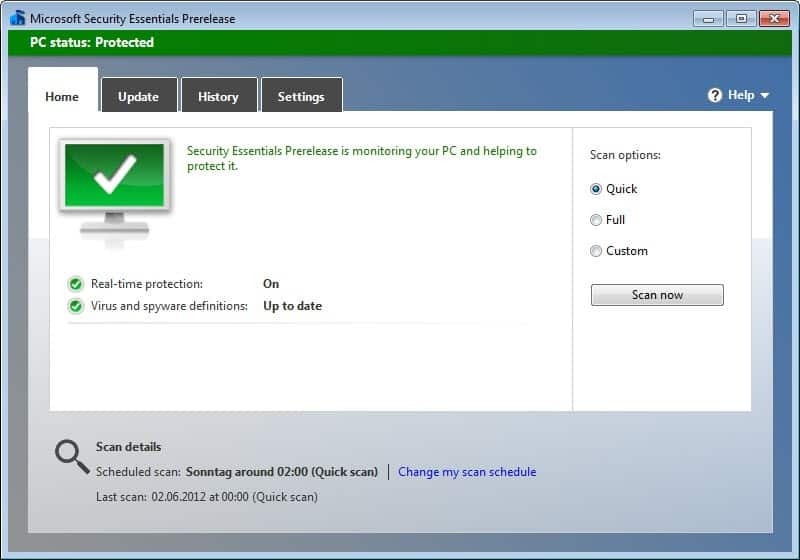 The following two screenshots show Windows Defender on Windows 8 and Microsoft Security Essentials on Windows 7. A difference between Windows 7 and Windows 8 is that the new version of Windows Defender will be automatically installed in Windows 8. This move has caused quite some concern, as third party security software companies feared that the move would impact their business in a negative way. But it was not only antivirus companies who criticized Microsoft for the move, OEMs too did not like the fact as they made a good chunk of money with every antivirus trial version that their PCs shipped with in their initial stage. 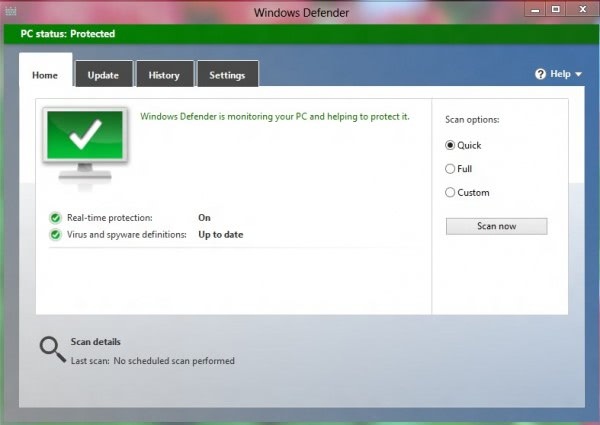 If another antivirus solution is detected by Windows Defender will not be activated on Windows 8 for the time being. Windows Defender will however monitor the updating of the antivirus solution and will begin a 15-day countdown. The user in this time will be informed that the current AV has expired or not been updated for a certain amount of time. When there is no action on part of the user to remedy the situation, Windows 8 will suggest to the user to install Windows Defender, or a comparable third party antivirus software from Microsoft Store on the system. We do not know yet how effective the detection is, and if free and commercial security solutions will all be recognized by Windows 8. It is likely that users will have options to manual intervene in the process at any time should the operating system fail to identify an installed security solution properly. “When you try and install multiple antivirus (AV) solutions on a system running the Microsoft Windows operating system,” then you’re asking for trouble. *Every* AV program wants to be Stalin, and have total control of the PC. Installing multiple AV programs if you’re not using a custom shell to manage them is idiotic; all you end up with is a PC that performs like a brick and produces lots of heat. I am using Avira and Microsoft Security Essentials. They’ve been playing nice so far. Along with ZoneAlarm. Herr Brinkmann, it would good to know who pitched the complaints. Especially the security companies, they are more concerned about their own personal bottom line as opposed to the security of the systems they should be protecting. When I find out who the manufacturers are, that will be the last I deal with them. Both should be more concerned about their clients/customers and they will be duly rewarded for their efforts. As it is – frak ’em. Panda Cloud Antivirus 1.9.2 runs fine on Windows 8 CP. Also, Panda Global Protection 2013 Beta runs fine on another similar computer. In both cases Windows Defender automatically became disabled. AV trial version? I’ll choose the built-in AV over bloatware any time. Im all for the built-in AV and the implementation is good news for me as a long time user of AVG free. As David implied, the less bloat, the better. Im naturally opposed to mega corporations holding monopolies that dictate the mainstream with bais to their agenda and an avid supporter of open source software. However in this case, being a matter of security I feel we are better off having our security measures handled directly by and from the operating system and the ones who built it and know it best.